Each week I’m appalled all over again by the rising prices of groceries. 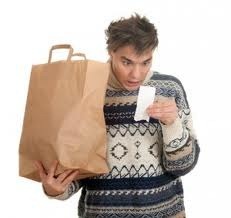 They said it was due to escalating gas prices; then gas went down and groceries soared even higher. What’s a person to do? We’d be wise to study the grocery ads and plan our weekly needs carefully. Since I’m old enough to recall a 25 cent loaf of bread, it is shocking that my favorite brand sells for $4.24 today. I’m thinking seriously of pulling out my bread maker, dusting it off, and making my own. 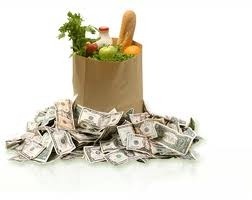 In the meantime here are few suggestions on how to cut a few bucks each week on food costs: Before heading to your supermarket, check the weekly newspaper inserts on Walgreen and CVS specials. I often pick up coffee and eggs for half what I’d pay at my Kroger. I gave up buying prepared salad dressings years ago and figure I’ve saved enough to finance a small yacht. 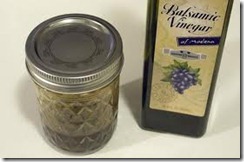 It’s just too easy to mix up some olive oil, balsamic vinegar and mustard in a bottle. I keep it in a jar next to my cooktop where I can give it a shake and add to cooked vegetables, meats and salads, or take a swig if I’m so inclined. Pick up a case at a chain like Fred’s or Wal-Mart (I got a case for $3 at Lowe’s one week recently) instead of buying single bottles at gas stations and convenience stores, where they can be nearly four times as expensive. Nothing beats the convenience of pre-shredded, but opting for a brick of Cheddar or a ball of mozzarella will save you $2 to $3 a pound. 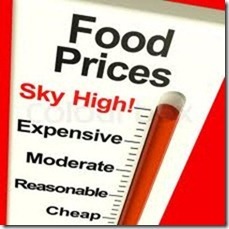 Examine shelf labels to compare the cost per unit. 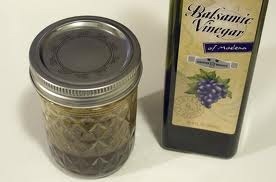 While the prices of bigger containers often run 15 to 30 percent less per unit, there are exceptions, so don’t automatically reach for the largest bottle or jar. In summer, look for big sales at your supermarket on ketchup, mustard, and mayonnaise, which will be discounted by as much as 30 percent for barbecue season, says Julia Scott, the founder of BargainBabe.com, a money-saving website. Download the free app Coupon Sherpa, which allows you to redeem local in-store coupons instantly without having to clip or print them. Click on a merchant and link its loyalty card to your account. Select the available discounts you want and they will be applied to your purchase when your loyalty card is scanned. Dollar stores and discount grocery outlets are good places to find half-price cake and muffin mixes. They might not be in the most recent packaging, but you can check the expiration date. Steer clear of individual containers (say, five six-ounce cartons). Instead, pick up large ones that contain at least 32 ounces, from brands such as Dannon and Stonyfield Farm. You’ll pay up to 40 percent less. This entry was posted in Coping with retirement and tagged Coping with high food prices, Save big money on food, Saver's tips by Emily Jones. Bookmark the permalink.